We had dinner out with my in-laws on Saturday night. Because I love to bake, I offered to make dessert to eat at home, instead of forcing too much food at the dinner table. I took inspiration from Tartelette’s Blueberry Heart Cheesecakes for the cheesecake, adding cinnamon-y apples and caramel for a really delicious fall treat. Recipe after the jump. Use the thicker variation of the sauce, with 1 1/4 cup cream. Make ahead and let cool to just about room temp. It will still be soft, if it is not, warm it in the microwave for about 10 minutes. Do yourself a favor and wash everything as soon as the caramel is cooked (poor the caramel into a jar). The stuff is sticky! Mix together and pat into 4, 4” springform pans. Cook in a preheated 350 degree oven for 10 minutes. Reduce heat to 325 degrees. Beat cream cheese and sugar until fully combined and fluffy. Add eggs in 3 stages, until completely incorporated. Add remaining ingredients, blending until just combined. Divide evenly among the springform pans. Wrap pans in foil (make sure the foil is at least as tall as the edge of the pan, if not taller.) Place cheesecakes in roasting pan and add hot water until it is halfway up the sides of the cake pans. Bake at 325 degrees for 40-50 minutes. The edges should be set, but the middle wiggles slightly when jiggled. Remove foil, cool on rack, then cover with plastic and refrigerate overnight. Melt butter in a skillet. Add sugar and cinnamon and stir. Add apple slices to pan. Cook, stirring frequently until apples are tender. Cool to room temperature. Run a knife around the edges of the cheesecake and then release it from pan. Drizzle caramel sauce on plate. Add cheesecake (I cut each cake in half). 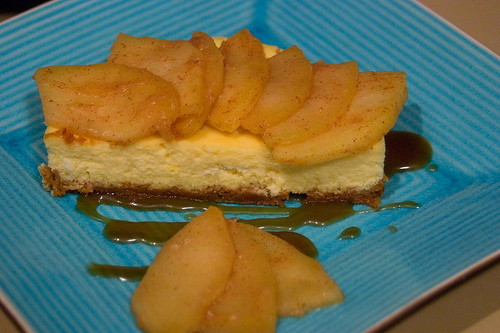 Top cheesecake with apple slices and more caramel sauce. Eat. That looks so good – thanks for the recipe! That looks so good! I won’t ever make it myself, but… yum! I’m not a cheesecake person myself,(it’s the texture) but I’ve been wanting to try a ricotta cheese cake recipe. I think I’m going to do it for my mom and anthony’s b-day in dec.